le choix des fans: Yes, ofcourse! Would toi want to live in Dublin? 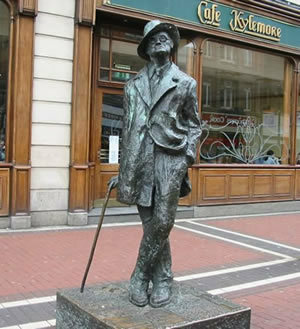 Have toi ever been to Dublin at st. Patricksday (for the parade)? What's your favori band from Dublin? How did toi get to the Dublin spot? le choix des fans: I looked it up. Where can I buy a coat?? Dubliner Ronnie Drew passed away last week, for many years he performed alongside Luke Kelly, Ciaran Bourke and John Sheahan as a member of The Dubliners (who inspired many Irish bands as diverse as U2, Sinead O'Connor, Damien Dempsey and The Pogues) speaking as an Irish musician (though not born in Ireland- regretfully, my family originates from co. Donegal) and a member of The Vandolins, a group influenced par the likes of the Dubliners, I would like to pay my respects to Ronnie Drew. slainte! Here are some questions wich toi can fill in as a comment. Always nice to know what people think, right? 1) Do toi live in Dublin? 2) If toi don't live in Dublin: Where are toi from and why did toi go to Dublin? 3) Who is your favourite celebrity from Dublin? 4) What's your favourite building in Dublin? 5) Do toi like the Millenium Spine? 6) What's your favourite park in Dublin? 7) What's your favourite pub? 10)The U2 Studio's: For fans of U2; take a look at the U2 studio's! There are two in dublin: Windmill Lane and Hanover Quay. The one in Hanover Quay is still used, and maybe toi can meet Bono ou someone else! 9) General Post Office: The building was used in the Easter Rising, and there are still bullet holes in thepillars in front of the building. Nice to take a look, ou post a card ofcourse! On 24 April 1916, Patrick Pearse stood outside the General Post Office in Dublin and read a proclamation announcing the establishment of an Irish republic under a provisional government. Dublin based le batteur, batteur with many years of experience in different styles and genres. Works with both originals and covers bands, available for recording and gigging sessions, tours, drum tution. Check website for the latest events. an answer was added to this question: Where can I buy a coat?? a comment was made to the poll: Ever been to Dublin? a comment was made to the poll: Would toi want to live in Dublin? a question a été ajouté: Where can I buy a coat? ?